I found out today that my last post may have been a fluke. I actually may have been living out of standards and ideals that I placed on myself by what I think others expect or decide what my life should look like. Funny how none of you told me how to live. Yet, I took it upon myself to assume that you did and then, I made up in my mind what you then thought I should do, and what you thought my life should look like. I do not recall any comments on this blog telling me how I should live my life. And if you did, I actually would laugh at the ignorance of the idea and perhaps the action. However; I instead, decided that fun and excitement was not aloud for my life(right now). And it(the physical exhaustion, pain, and mental ache) turned up today as a big harry monster! I was so scared of the monster that I cried, panicked, and almost ran. Then my big Brother, he is bigger then me, reminded me why I do what I do. Because, it is fun and exciting every single day. And if it wasn't, I would not do it! That is just the way I am. I am passionate about people being passionate about what they do everyday of their life. And I expect nothing less for my life. Sometimes you(I) get caught up in ideals and standards that are set by others and you (I) forget about my values and principals that I set and chose for my life. Then I lose myself and it makes me sad, more so angry, angry that I would let a false assumption destroy my well being. Sometimes you ( I ) cannot get past the quicksand, the minutia, of what we are sitting in until someone else points it out to you (me). The true healing happens when you acknowledge, complete, and move on. The truth is you declare what your life will look like and you decide what your values will be for your life. Not anyone else. If there is suffering in your life play is missing, fun and excitement! Check and see, is there play, fun and excitement in your life? I know for me.. today there will be fun and excitement in everything that I do! We are gearing up for the excitement of the games. Interviews, 5 workouts a day, ART, ice, you name it.... we are doing it. 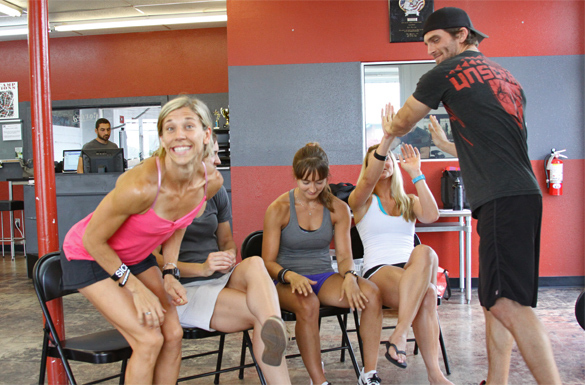 Here I am with 3 of the 44 athletes + me that will be at the 2010 CrossFit Games! Very exciting! This pic is just an example of how Savannah gets when she gets chocolate. My daughter may turn out a little like me!